Postcards From A Life Well Traveled: San Francisco et. al. The rest of the trip was quite enjoyable. We did a little tour of the Santa Cruz mountains and sampled some of the wine found up there. I didn't realize there were any wineries so close to Palo Alto until my Dad put me on to them. While the architecture is not in the same class as those in Napa or Sonoma, the wine is just as good, especially the reserve wines. We also did a spin up through Napa where we hit the Beringer and Sterling wineries. Beringer is the oldest in the valley and the reserve wines were quite good (though we didn't like the regular wines). Sterling is at the top of a small mountain at the end of the valley and styled in a Mediterranean fashion. Not struck on the wine there; I guess you go for the view. Over the mountains and into Santa Cruz where it's easy to see the California surfer culture. We drove up the coast to Waddell Beach, where a ton of locals were out ripping through the waves. Lots of colour and lots of action. I could have easily stayed all day and shot my CF cards full, but we didn't plan for it. Next time! I've broken out all the surf shots into a special set, so click here for a surf only slide show. Another side trip we made was to Yosemite National Park. I'd never been before, but having seen so many of Ansel Adams shots of the area, I just had to go. I decided to try and shoot in black and white for the trip, and I must say, the rocks do lend them selves to that medium. Yosemite only shots are here. Shots from the whole trip are here in a slide show. 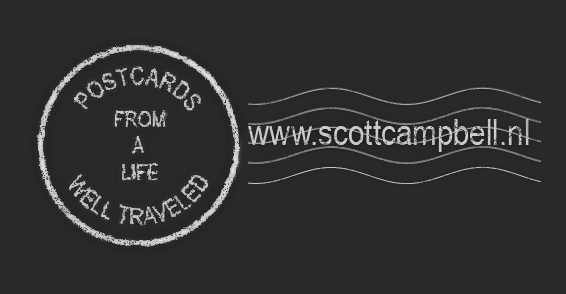 Much like a tourist would purchase a postcard to document a special place on a trip, I try to capture life moments on a 'postcard' to share with others. These postcards may be from my own life or from someone who wanted me to create their own personal postcards. I hope you enjoy viewing these postcards as much as I did creating them. To see more of my blog post, click on one of the key words to the right of the page, then use the "Older" and "Newer" links at the bottom of each post. Many of my images are available as hand-made fine art prints. To see what is available and to buy one, head over to my web gallery here. © 2007 - 2014 Scott Campbell. All RIghts Reserved. Powered by Blogger.